Have you heard the term, “liquid facelift” or “liquid lift?” This term refers to a non-surgical facial rejuvenation procedure that combines BOTOX® Cosmetic or Dysport® with facial fillers to achieve a natural, renewed look to an aging face*. As we age, the face begins to sag as volume is lost due to declining collagen and elastin in the skin. Wrinkles and skin folds are also more pronounced. What Facial Fillers Are Used In A Liquid Facelift? Facial fillers such as, JUVÉDERM® and JUVÉDERM® Voluma XC, Radiesse®, Restylane® to lift and add volume to a man or woman’s face. Skillfully injected by BAXT CosMedical®’s board certified dermatologists, facial fillers will lift the face to help improve jowls, heavy nasolabial folds or smile lines, marionette lines, and other wrinkles that may occur with aging*. A liquid facelift is often combined with BOTOX® Cosmetic or Dysport® to smooth out dynamic facial wrinkles and forehead indentations or furrows. Can A Liquid Facelift Be Combined With Other Procedures Or Technologies? Other skin rejuvenation and tightening modalities, such as Ultherapy®, Fraxel®, or other laser and light sources may be recommended to renew the skin. Using ultrasound energy, Ultherapy® treatment lifts and tightens skin on the face, neck and check. 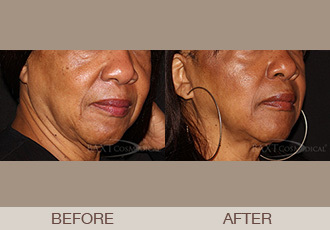 Fraxel® Laser improves tone, texture and pore sizes. This proven technology also removes brown spots, smooth acne scars, decreases wrinkles. Fraxel® can be used on the face, neck, chest, hands, and other body areas. Kybella® may be also be recommended to further sculpt and lift the face. Kybella® is used to minimize a double chin or sub-mental fat through a series of injections. The skill and experience of the injector is important in order to produce natural-looking results that sculpt, contour, and lift the face. Dr. Rebecca Baxt and Dr. Saida Baxt are certified injectors with years of experience in administrating facial fillers and other injectables. Dr. Rebecca Baxt is a certified Allergan trainer for BOTOX® Cosmetic, JUVÉDERM® Voluma XC, and other products. We offer free consultations. In this consultation we can tell you what a liquid lift could do for you and give you a better idea of what costs would be involved for your specific needs and desired outcome. Call or contact us online today.